Loving Instructions On Living A Life That "Makes A Difference!" 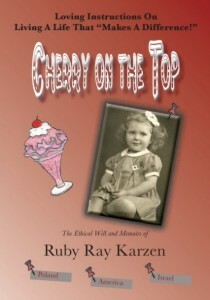 Ruby Ray Karzen is lovingly known as the "Rebbetzin's Rebbetzin" - a role model for the young woman destined to be the wife of a pulpit Rabbi. She has been a dynamic mentor and an ideal example of a partner in the Rabbinate in America and Israel. Ruby has also had additional careers in Real Estate, Interior Design and Jewish Education. Until she made Aliyah, she was the Executive Director of the prestigious Hillel Torah Day School in Skokie, Illinois. Ruby served for almost a decade as President of the Association of Americans and Canadians in Israel (AACI). An inspirational speaker, she is a constant source of support for the Anglo community in Israel, always ready to serve. She is an avid writer; many of her articles, spanning topics on Israel and Interior Design, have been published in magazines and newspapers. Ruby is recognized in Israel as the "Go To" Interior Designer, with just the right touch, especially when you want to turn a Churban into a luxury dwelling.